I'm delighted to begin the week with a photo shoot that I did yesterday in the forest near my house. I was with my friend Lilly, who makes a great model, and we had such a nice time working together in the Fall weather under a golden sun! I'm happy to share the results of our forest picnic with you today, which is in partnership with . 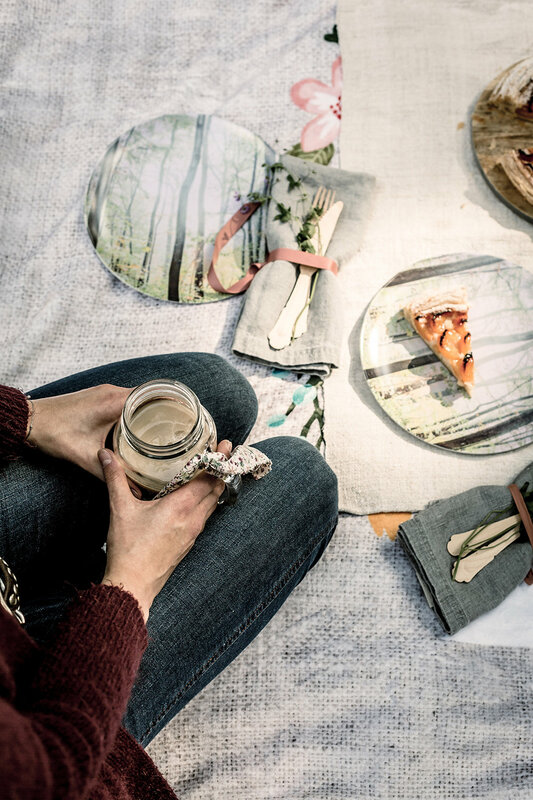 I will share 10 ways to create a personal and cozy forest picnic for two. For this scene, I've customized a , , , a , and - all from . I'll detail each below along with my 10 tips for a creating a lovely little couple's picnic. Are you ready? 1. FAST, SIMPLE, HOMEMADE. The first thing to do when you want to plan a quick picnic for two is to keep the food simple but homemade. Why? Homemade shows you care and everyone appreciates something made by hand and usually one cake is cherished more than a spread of grocery store food. Make a cake or something else sweet that will fill your bellies but also be easy to pack and carry. Remember, you are only spending a few hours together, you don't need to bring a cooler and a wagon full of food! 2. ADD A PRETTY PHOTO BLANKET. I love soft, warm blankets for picnics in the cooler months. You can use like I did to customize a for you and your sweetheart. I suggest fleece so you can bring it home and use it later on the sofa. Maybe you can incorporate a photo into the motif that your loved one took, like I did below? It's a big photo of green apples from my husband that has meaning to him. 3. PACK ONLY WHAT YOU NEED. No more! Next, you'll need to pack everything you need for eating and drinking but ONLY what you need, don't get carried away and overload your bags because carrying all that stuff around isn't how I enjoy going on a picnic. I prefer to bring exactly what I need: Glasses or cups, forks, napkins, plates, a knife if you need it for slicing, etc. Think of everything and pack it along. 4. MELAMINE PLATES. I love the idea of using melamine plates for picnics because then I'm not throwing away plastic and paper each time I picnic. I wish more people would pack and stop using paper products that immediately end up in the trash bin. For these plates, I also used photos that my husband took. Imagine how happy your partner would be to see their photos on plates? How thoughtful! And of course, you can use them over and over again for picnics later on and even at home for those casual pizza nights by the television. 5. Have one, easy beverage. And a bottle of water. I like to have one "signature" drink for a picnic and then, a bottled water. 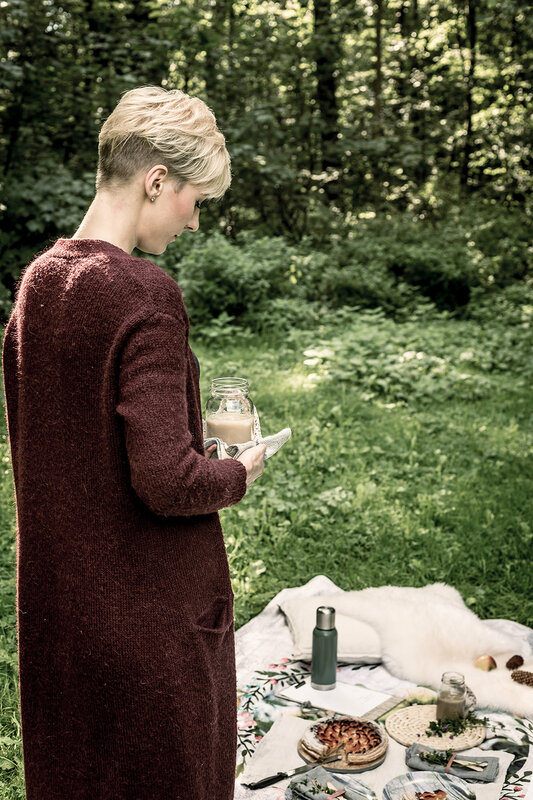 For this picnic, I went with coffee. Another tip when bringing coffee or tea is to mix in the milk and sugar first at home, then put it in a thermos. Don't pack everything separately, the less you have to bring with you the better. If you want to do iced coffee like I did, pack the ice separately in a small container that keeps ice from melting. You can also skip the ice and just do hot coffee or tea. I love iced coffee though and since September isn't cold enough for me yet to drink hot coffee at an afternoon picnic, I wanted to try iced coffee and cake -- and it was yummy! 6. GLASSWARE. YES, REALLY. I never thought to use glassware at a picnic, but when I saw these thick and very sturdy glass mason jar mugs from Shutterfly, which you can customize with your own text, I was totally on board with GLASS. Again, I like the idea of being able to use something over and over again versus throwing it away. After the picnic, I can use these cute for hot cocoa, beer, iced tea, cocktails or even a vessel to pop in a bouquet of flowers. My mugs say "Tee loves Holly" and "Holly loves Tee" (Tee is the nickname of my husband.). 7. LINEN VS. PAPER. Another nice tip is to bring linen napkins instead of paper. Why? For a romantic picnic, cloth feels classy and nice. And less waste! 8. ADD RIBBON AND GREENERY OR FLOWERS. It's so easy to make your blanket look pretty with next to nothing! You can pluck a few sprigs to add to your picnic scene. A few wildflowers, cloud berries, raspberry sprigs, or even some pine or leaves can look pretty tucked into the napkin with a simple ribbon. This takes two seconds but looks so nice, don't you think? 9. A STURDY TOTE. This is a must! Baskets are nice but for me, not practical. For the perfect carry-all tote, I selected and customized this . On the linen bag the word Ausflug is embroidered and I chose brushed gold as the accent color since it coordinates best with my outfits. Ausflug is the German way of saying to take a quick trip, to sorta fly away for a bit (but not literally). It's like taking a day trip or running away for a few hours to take time for yourself. 10. ADD A SPECIAL GIFT OR TWO. I love to give little gifts to people whom I care for deeply. For this picnic, you could customize a deck of cards or even a memory game so you can play together. For my picnic, I customized a with photos that my husband and I took over the years of our little boy, Aidan, as a gift. I added words the best describe our child as he is today at age 3 1/2. My husband really loved these! Don't you think that parents always carry their children with them wherever they go, even when the child isn't around? They still come up in conversation and are always on your mind. That's why parents tend to give things to each other that often involve something that includes the children. A memory game is sweet for the child but also something you can play with them, so it's a nice gift to share with your family. 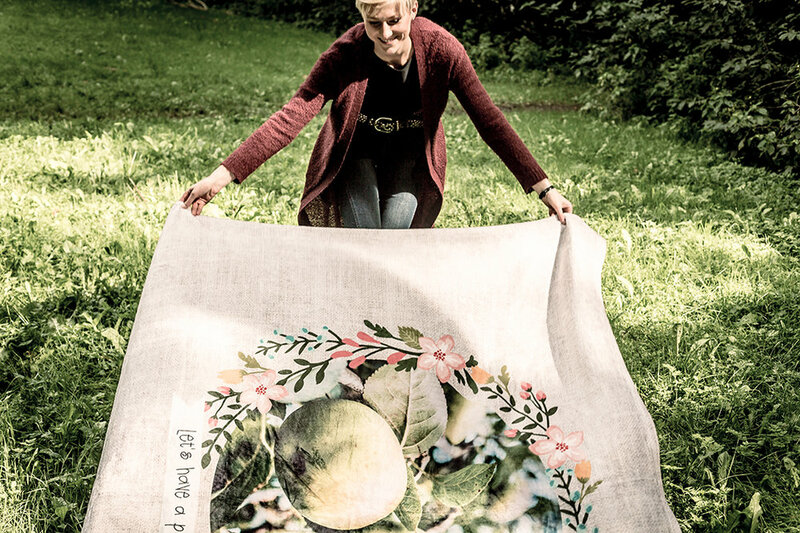 Another nice gift, which isn't needed for a picnic but is small enough to pop in your tote bag and bring with you, are using photos that your partner took. Imagine how happy they'll be to have something else in the home that's so personal! My husband really liked these, especially since he uses coasters every day on his desk for his tea or while having a drink during a film because we have nice tables in our home that we don't want to leave water rings on. Coasters are not the most modern home accessory, I know, but they are still good to keep around and to use. Didn't these come out so nice? I'm so happy that you came on this little picnic adventure with me today. I hope my ideas have inspired you to think simply when it comes to entertaining but also, to try to personalize the things you buy so that they are more meaningful and lasting. Before this, I'd never in my life thought to put photos on anything other than my wall or in photo books, but now I'm convinced that adding photos to everyday things can add such a special touch, and warm the hearts of those whom you care for, too! This post is sponsored by . Awaken your space with your vision. Shop Home Decor for personalized home accents that are uniquely you. Hello everyone! I'm so happy to be here today to introduce you to one of my favorite design gurus all the way from Australia, Mr. Jason Grant. Not only is he a fabulous stylist, but he's a book author and works with major Australian brands to develop products for the home. His brand new book, published by is available worldwide and is just gorgeous. I must confess, in person this book is most impressive with its large format and gorgeous glossy photos - a true decor lovers design guide to display on the coffee table. The color scheme of the jacket overall works perfectly for my Autumn decor, too. I've paired my copy with some fresh Heather from the nearby heath, a Marie-Stella-Maris candle, and other favorite interiors reads. Tea, cozy socks and a chunky knit throw are certainly optional, but a necessity for me as northern Europe is currently under a blanket of gray and rain. As the seasons change, all I can think about are these precious, cozy moments at home with a stack of my favorite books, like Modern Retro Home, to draw inspiration and ideas from. The woven string chair is modern but references ’50s/’60s style. The fabulous aqua glass jar – a flea-market find – makes a color-perfect vignette with the portrait. The trestle table with its cork top and the natural timber stools are well-priced pieces. TIP 1: HUNT IT DOWN. Hunt down quirky or individual items that will add fl air to basic flat-pack or budget furnishings. Framed vintage posters are a strong focus in this house. ‘The multiple Le Corbusier drawings and posters hanging throughout reference the modernist roots and bones of the house’, explains the owner. TIP 2: FRAMED. Most of the artworks are framed in a timber similar in color to the Scandinavian-design hide chairs and the robust shelving, creating unity. The squishy Arfle Marenco sofa, which is new but a reissue of a ’60s design, is piled with sheepskin, folk-art rugs and kilim cushions. TIP 3: SOFA SO GOOD. A sofa is an investment and sets the mood, the look and the tone of a space so it’s an important starting point. Some of the key elements to consider are size (will it fit in the room); proportion (is the scale right for the room); and shape (tailored mid-century or laid back and casual). Comfort, color and material are other critical considerations. Oh, and price. A quirky chandelier-style beaded pendant or a minimal Chinese paper shade might suit your scheme perfectly, you don't always need designer pieces to make an impression. TIP 4: LIGHTEN UP. Pendant lights can create a focus in a room by day as well as by night. Take the time to choose a light fitting that adds to a room’s personality and isn’t an afterthought. This is a very masculine – and maximalist – space. Thrift-shop chic meets vintage finds, classic pieces join favorite treasures and things have a patina of age. The room is shot through with blues and greys and interesting textures. It looks comfortable and lived in and the owners say it is ‘continually evolving’. TIP 5: OWN IT. Have the confidence to mix genres and styles in their own, unique way. Everything doesn’t have to be perfect and it doesn’t have to happen all at once. Search out pieces you love over time and that work for your lifestyle. The angled lamp, shag carpet and kilim-covered cushions say modernist, but in a casual way. Special pieces include a vintage tribal mirror from Etsy France and two linen swing chairs. The showstopper is the stained black timber wall (using stain instead of paint lets some of the grain show through). TIP 6: REBEL. 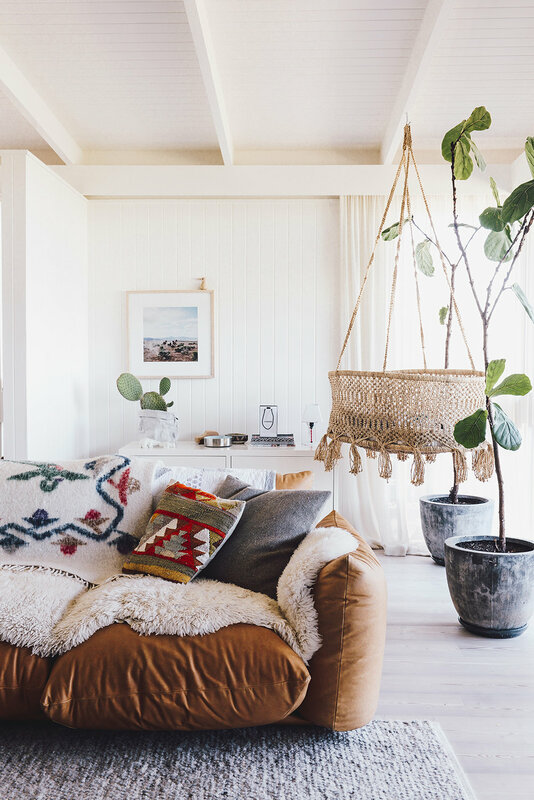 A beach house doesn’t have to be blue and white, as this shack proves. This chic beach shack blurs the lines between old and new. The unframed artwork is just pinned on the wall, and the rustic table and textured grey planter are easy-going accessories. White walls and white floors in this art deco apartment create a cocoon for the stylist-owner’s signature collection of casual sofas, old-world artworks, vases and collectables. TIP 7: RELAX A LITTLE. Introduce a casual look, such as the unstructured sofa in crushed linen with mismatched cushions. Fabulous tangerine-colored Italian designer chairs contrast with a cork-top table from a collection that English designer Ilse Crawford did in collaboration with IKEA. TIP 8: HIGH MEETS LOW. Genuine designer pieces can be an expensive investment, but if paired with budget buys you can introduce an individual look without breaking the bank. Hello dear friends, I hope that you are doing good and are having a nice week. I'm busy with my little boy and of course, working on my business and preparing for my upcoming trip to Finland and also for my e-course. I've planned a for all of you, something that will uplift bloggers, content creators, influencers... All of us. Blogging and social media are changing every day. The internet feels very full right now, have you you noticed? Yet honestly, who cares what is changing and how fast it's all going and how many people are sharing and posting and talking... Because in the end, if we know how to create great content and share in a way that gets seen (and heard), then we always have the ability to reach out online regardless of the platform or medium we choose. Everyone has a chance to rise and shine. That's why this class is for everyone really, all who wish to be seen, heard, understood and felt in this very big, often complicated, online world. Please join the class with me because I believe a lot of you need it right now. I know I do. I need to talk to you about content and what I've learned and am still learning about what works and most importantly, what doesn't. will focus on creating content that people respond to. How many times have you posted something on Instagram and it just sat there, with very few likes, and your heart just sorta felt like it was sliding down your chest, making its way to your leg, until completely falling out onto the floor. Plunk! I've felt this before, like my heart dropped, because I was so sad that so very few responded to my words and photos. It happens to us all, so this class will be primarily to educate you on what makes content "sticky" and interesting to others, but also to hold a very open discussion around what we as content providers can do to ensure a better track record for our content. We create to be seen after all, right? I believe everyone creative has a sensitive soul, whether they'll admit it or not. Sensitive people want to be seen, but also wish to be heard and felt and understood. We want to know we matter. We are a complex bunch. This is also why when you partner social media and blogging with sensitive, creative people, you will see lots of hearts on the floor and sad eyes when a post doesn't "perform" well or an Instagram photo is a bust. We aren't being dramatic or immature, we are human. We feel. I want my class to show you how to make your content meaningful and valuable but also how to create content that you actually are excited to make. Seats are limited, so if you are interested please do not delay. Note: Class starts a week from Friday, on September 15th, and only 100 people will be able to take it so we keep it small and special compared to our 500+ classes normally. I wish to really dive into content creation and general content sharing issues lots of us face, and hold some good, solid discussions around all of this. We'll have an open chat live with me on two Fridays and I'll be active in the forum and in the comments section beneath each lesson I post so you can directly interact with me on the spot. The class is only two weeks long, but what I will share will last your entire lifetime and give you amazing advantage for your career, I promise you that. After class, you'll have an extra month to review materials and download everything. I've partnered with to share a few of my favorite ways to turn all the photos on my Instagram into something more meaningful to decorate with in my home. I had this idea to create a candle with an image of my son on it, so I selected the from their site and placed a photo of little Aidan on it taken by my husband, an image that is very precious to me. When the candle arrived yesterday, I felt so happy opening the orange box because it the candle not only smells just wonderful but when I saw the photo of my son on it, it really touched my heart. Today when I placed it on my table, the warm glow of candlelight coupled with fresh roses he and his father brought home from the farmers' market today, made me feel really cozy and in a bit in an Autumn mood on this moody and cold Friday where I live. When it comes to decorating, I believe in simple, special touches. Shutterfly is an unexpected spot to design your own products for home a special meaning to you, which is why I wanted to tell you about them. Not only can you add your photography to things like mugs, candles and pillows, but you can add your illustrations too. If you're an artist, seeing your artwork on something that you use each day would be very uplifting, don't you think? These cherished customized items also make great gifts. I will show you some mugs I personalized on my Instagram soon for my husband and I that I know you will love and want to own for yourself with photos that you love, too. 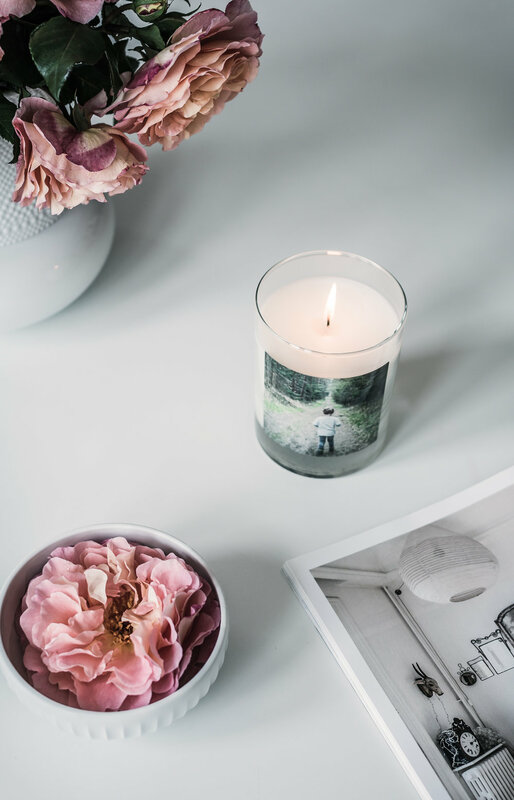 You have to get a candle from and personalize it for your space, it's just the nicest present to give to yourself and your home! Honestly, I don't do much with my photos with the exception of publishing them online, selling them into magazines, or putting them into my books or in the books authored by others. When approached me to work with them, I felt like it would be a huge burden to embark on a project where I'd need to choose products for my photography. That's why I started with a candle. It was simple and I love the results. In the next week or so, I'll show you a , some , , a and several other items I personalized, too. It was really fun and I'm already dreaming up what else I can personalize with family photos for my home. Maybe you should try it, could inspire you too. Uplift and awaken the senses with big, bright citrus, sweet berries and juicy nectar. I've been a big fan of Finnish designer for nearly two years since I have one of her and love it. I take it on photo shoots to haul things like pillows and blankets, and I take it when I transport boxes and bulky stuff to the post office, a shop or to see a friend. It's the best bag in the world, and I get tons of comments when I use it - mostly, how fond everyone is by its enormous size and sheer gorgeousness. Don't these image give you such a beautiful, restful feeling inside? I like them so much, such pretty, moody lighting and styling too. I was reminded of Sanna Ja Olli today because I've been ed by (the largest newspaper in Finland) and (Finland's lifestyle site for women) for interviews since I'll soon be in Hensinki lecturing at . I'm so excited that Finland is welcoming me so nicely to their country, what an honor and privilege to be received so warmly during my first visit. During one of the interviews, I was asked about Finnish design and what attracts me to it and who is designing in Finland that I admire. One of the brands I named was Saana Ja Olli since I'm madly in love with her patterns and the simplicity and naturalness in what she produces. One of the interviews today was interesting, the journalist asked me what I thought about Finnish design, how I "saw" it. This was a question I'd never been asked, and I hadn't given it much thought until today. I explained that when I think of Finnish design, I imagine nature and powerful shapes and a bit of a Slavic aesthetic - from neighboring Russia mostly. I imagine shapes that are strong, clear and graphic. Finnish design also seems very sensitive to me, like there is an understanding of design in an almost spiritual, elevated sense. 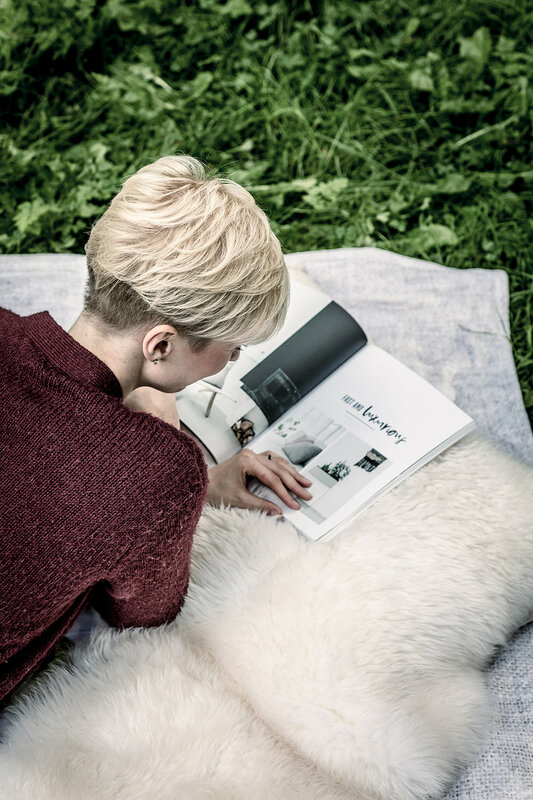 I don’t think of mass-produced or a consumer culture – I picture sustainability, sensitivity, emotion and also an excellent marriage of form and function. I also see simplicity but ironically, a bit of a sense of humor in the design – shapes are playful and experimental. When I think of Finnish design, I think of individual pieces, but not interiors. I couldn't really tell you what a Finnish home looks like. This is a strength I believe, what really makes them stand out. It gives them the power to create their own style through objects that they collect and love because they seem to adhere less to a certain mainstream vision. I'm not Finnish and I've never been there, so perhaps my perspective is not shared. I'm curious when I get to Helsinki and start inspecting interiors more carefully, what I'll learn? Do you have any impressions on this topic to share? I'm quite curious to hear them so please comment if you'd like. I don't bite. I love it when I come across a small-budget renovation because a lot of people think to have a million dollar "look" the renovations need to cost that much and it's just not true. I once was involved renovations on a regular basis, mostly city apartments but some homes and commercial spaces too, and I can assure you that the budget you set rarely is met - it's always exceeded and by thousands, sometimes tens of thousands. Have you found that to be the case too? Mostly, it's the labor that drives up costs. Don't you think? You try to save on labor by hiring less expensive contractors only to find that they need 3x the hand holding and double the time to complete the project as the more expensive professionals you'd turned down. Contractors can be so shady and if you've ever renovated a house outside of your own country, it gets even more complicated. When I worked on renovating the apartment we currently have in the city (when I was 7 months pregnant! ), our paint/wallpaper budget was 5k and it ended up being 10k in the end due to miscommunication, misunderstandings and just one thing after another that you'd never had even thought to factor in if you were still in your home country doing the same work. This small-budget (well not SMALL but I guess based on how it turned out and where it's located - it's small) renovation of a 1930's California-style bungalow in Sydney’s Lower North Shore is minimalist and gorgeous. (The total cost of the build was $410k.) The challenge was to reconfigure the home with living spaces that connected to the garden which would include a rear addition connected to the original space, all on a very tight budget. I love the angles, the natural light, the openness. Isn't it a terrific space? Clearly, their wishes we both met and exceeded by the firm they'd hired, . If you want to read all about it, you can over at where they've interviewed the homeowners for the nitty gritty renovation low down.